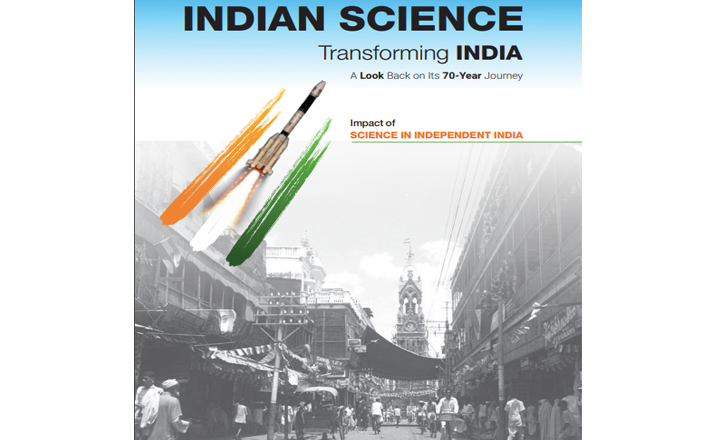 On 25th April 2018, The Indian National Science Academy (INSA) released a book on the impact of science on the growth of independent India. Titled, “Indian Science-Transforming India”, the book is a showcase of areas where Indian science has had a positive transformative impact; for example, the setting up of Amul co-operative, developing of plastic bags suited for storing blood in blood banks, the manufacturing of generic drugs and several others. The stories included in the book have been written by a group of four authors- Adita Joshi, Dinesh C. Sharma, Kavita Tiwari and Nissy Nevil. L S Shashidhara of IISER, Pune is the editor of the book. The book attempts to address the “lacuna in communicating how science has affected our society, and how it is upto the scientists to ensure that the public at large, and policymakers in specific, know the scientific contributions that helped in bringing leaps in all aspects of our nation’s health”, says, Ajay Sood, President, INSA in his opening note in the book. At the time of India’s independence, the literacy rate was just 12%, life expectancy a mere 32 years, poverty incidence rate of 80% and a population of over 340 million people. Not many imagined that in 70 years, the country would be a trillion dollar economy, among the seventh largest in the world. But for our insistence on using science and technology to build the nation, India would not have been able to overcome its colonial past at this rapid pace. Indeed, India is the only country that includes “scientific temper, humanism and spirit of enquiry and reform as a duty of its every citizen” in its constitution. The book holds a mirror to the same spirit of scientific temper visible in various successes our country has seen in the years since independence. It also tries to reinforce the idea that rather than looking out for individual heroes, people – general public and policymakers, should realise that our country progresses when the average scientific capability of the country is high. The stories engage the reader in interesting backgrounds against which scientists, engineers, businessmen and technopreneurs got together to solve needs of the society. The first story in the book, written by Joshi, brings to spotlight the need for developing indelible ink, which later became an irreplaceable part of the electoral process. In fact, India is now an exporter of this ink to several countries across the globe. Other stories written by Joshi talk about shaping of India’s biotechnology sector by Shantha Biotechnics (first ones to make Hepatitis B vaccine widely available to people of India); ensuring the quality of Basmati rice using DNA fingerprinting and finally, making of the Improved Samba Mahsuri variety of rice which benefits both farmers and traders. Tiwari takes the readers into the village of Anand, to meet the reluctant dairy engineer Verghese Kurien, who changed the fortunes of not only that village, but of the entire country. People know the story of the beloved ‘Amul Man’, but not that “basic nutrition security was achieved when milk and milk products were delivered to the doors of Indian middle- and lower-middle class families. This helped the next generation become physically and cognitively more competent” says Shashidhara. Tiwari also covers the story of generic drugs and the birth of blood bags –both of which are saving millions of life today. Other stories by the same author explore the use of plant tissue culture in revolutionising the growth of agriculture and the role Central Institute of Brackishwater Aquaculture (CIBA) played in reviving India’s aquaculture. Another author, Nevil portrays the story of two engineers who built an empire of laser technology in Surat, transforming India into a world leader in diamond cutting and polishing. And finally, the story written by Sharma reminds me, if it were not for the contributions of basic science behind the revolution of information technology, India’s status as an IT giant (and my unfettered access to the computer on which I write this article) would not have been possible. The book leaves you feeling positive about India’s 70-year journey, but more than that it gives you hope that with science and technology we can conquer more challenges facing our country. Going ahead, INSA plans to “bring out several such books on various aspects of Science and Society from 2019 onwards. These will cover India centric science issues such as water, drug discovery, crop genomics and provide an up to date account of where we are and the future projections”, says A.K Singhvi, Vice-President INSA. The printed copies of the books would be distributed at very low cost, with an online version available freely.